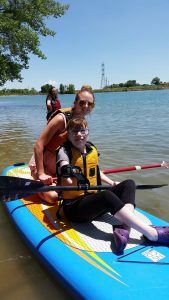 The NSCD paddle sports program is dedicated to providing an educational, therapeutic and fun experience for everyone. We have customized canoe, kayak and stand up paddle board (SUP) progressions for all ability levels. Our instructors review key participant information prior to the start of class and conduct an on-site assessment to place the participant in one of our three learning tracks. Friends and family are welcome. All equipment and adaptations are provided. Make new friends, hone your paddling chops and get instruction from our staff all year round. Get your feet wet! Seasoned kayaker? Hone your freestyle skills and learn from our experienced instructors. Join our club-style atmosphere to meet new friends. Open to all abilities. 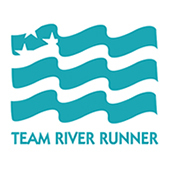 The NSCD is a Team River Runner chapter. We partner for instruction and adaptive equipment as needed. 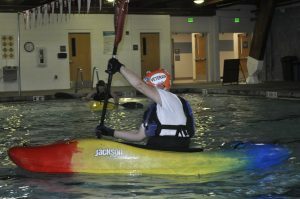 We invite all veterans to come out to the pool and improve their kayaking skills. The NSCD offers a wide range of water activities that are held year-round either indoor or outdoor (on lakes or rivers.) Participants must be independent and manage self-care or bring a care-giver to provide assistance. Relax during a mild Colorado evening at the NSCD Fishing Club. Participants will learn how to cast, use different lures/bait and gain knowledge on different types of fish. Participants will be supplied with equipment and bait if needed. Agencies, PASA’s, schools and other organizations are encouraged to book a custom fishing trip with the NSCD. 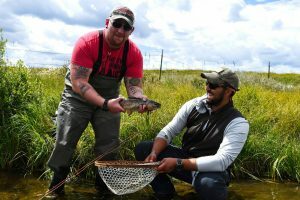 *All participants must have a Colorado Fishing license. During the Indoor Paddling Club, you will have the chance to learn and test your paddling skills in a fun and safe environment. Learn the basics or refine advanced paddling skills from certified and experienced instructors. This program is a great fit for both the veteran boater looking to stay sharp in the off-season or a novice wanting to learn the basics so they can hit the river when the season comes. Please join the NSCD and Team River Runner at the Carmody Recreation Center every Monday night. *Please note, we are currently in the process of transitioning this activity to the new online reservation system. Please continue to register via the link below through the end of March. Payment cannot be accepted on line through this registration, a customer service team member will contact you for the payment. Thank you for your understanding as we transition to the new system. Come join us for one of our most popular programs, a lake paddle day! During the day at the lake, participants learn water safety and paddling skills in a beautiful environment. Participants can choose from canoes, kayaks and stand up paddle boards. We suggest wearing a swimsuit or shorts and try to avoid wearing jeans or sweats. Participants must wear PFD at all times while participating in the program (the PFD’s will be provided by the NSCD). This is a great team-building activity! Try for the first time or hone in on your skills at canoe, kayak, and stand up paddle board (SUP).